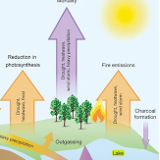 Extreme weather like droughts, heat waves and superstorms affect the carbon balance of vegetation differently. Up arrows indicate extra CO2 in the air. Down arrows signify that CO2 is removed from the air more slowly. Orange arrows are for short-term effects, purple arrows for long-term. Via Nature. A major new study in Nature, “Climate extremes and the carbon cycle” (subs. req’d), points to yet another significant carbon cycle feedback ignored by climate models. The news release sums up the key finding of this 18-author paper: Researchers “have discovered that terrestrial ecosystems absorb approximately 11 billion tons less carbon dioxide every year as the result of the extreme climate events than they could if the events did not occur. That is equivalent to approximately a third of global CO2 emissions per year. Great article Joe, I say we can turn it around with better systems design. www.environmentalfisherman.com I believe we can turn it around. I can see it and feel it. As a fisherman I can tell you that life begets more life, and death begets more death. The momentum feeds on itself. When systems start to crash, it’s too late? I don’t think it’s too late for us yet, but I may be wrong. We need, and I have the systems to green the earth. Time and tide wait for no man. 250,000 dead alpacas in Peru don’t lie. Maybe someone should send the study to Peru, which is experiencing extraordinary cold temperatures. It won’t matter to the ‘new deniers’; those who don’t believe sattelite observation which show no increase in global temperature for 16 years – and counting. 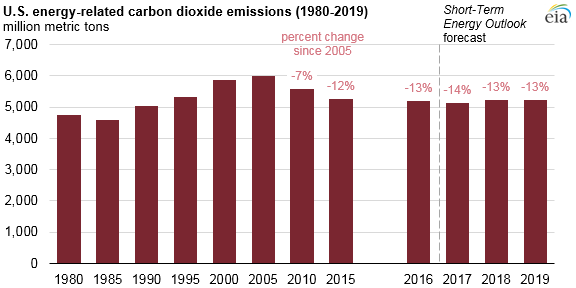 [caption id="" align="alignnone" width="576"] Source: U.S. Energy Information Administration, Monthly Energy Review, Short-Term Energy Outlook [/caption] EIA estimates that U.S. energy-related carbon dioxide (CO2) emissions declined by 861..